Cedar Creek Ranch resides on 60+ acres of heavily wooded areas, creek crossings and fields. Cedar Creek Ranch is within 10-12 miles from Starved Rock State Park, Matthiessen State Park and Grand Bear Lodge. The ranch is just east outside the town of Cedar Point, Illinois. In June of 2000, Cedar Creek Ranch was established after 60+ acres was acquired by Paul Williams. In 1998 Paul purchased his first horse “Vegas”. This relationship blossomed rapidly and so did Paul’s passion for horses. 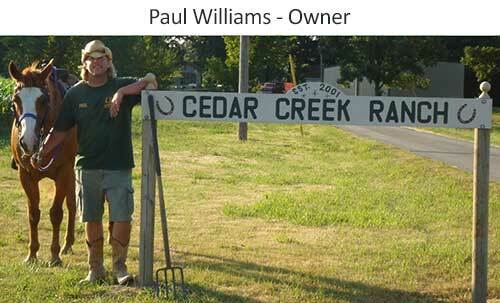 In 2000, Paul opened his business to providing boarding stables and land grazing for horses. Paul identified with the many requests of people wanting to ride horses but necessarily not wanting to own them. In 2007, after much hard work, dedication and support from family and friends, Paul was able to open up riding trails through out his land and offer public trail riding. Paul and the many that support him, are continually striving to add more trails and acquire more land so that all may enjoy the beauties of nature at its best through trail riding and the boarding of horses. In late 2010 Cedar Creek Ranch constructed another value added service to our customers by providing the Illinois Valley area’s best burgers, fried chicken and BBQ at The GunSmoke Grill. Stop in to have lunch, dinner, apps, cold drinks and a full bar. See our link at bottom of page. Copyright 2016, Cedar Creek Ranch, All Rights Reserved.